The release has gone out and it is that time of year. We are upon the 6th Annual Gentlemen’s Ball! For those who don’t know, The Annual Gentlemen’s Ball is an event for the who’s who in Urban LGBT. The couple who throws it are amongst the upper of the uppers in the Atlanta scene. Not to mention, they are FINEEEEEE!!!! Ha. In any case, if you are ready to attend, get your outfit together like you are heading to the Met Gala…. The nation’s best and brightest thought leaders, visionaries and social influencers will celebrate the accomplishments of LGBTQ of color genius during the 6th Annual Gentlemen’s Ball, Powered by UPS, 7 p.m. Saturday, Sept. 30th, 2017 at the Atlanta Marriott Marquis Hotel. Under the theme, “We Are Royalty,” this year’s formal celebration is the signature event of The Gentlemen’s Ball Weekend set for September 29th through October 1st. Three days of programming filled with activities for guests and allies to recharge and reimagine their lives. Empowering experiences include: a health & wellness fair, workshops on love, relationships and financial planning, along with parties, mixers and socials before and after the ball. The message of unity extends to the ball’s cohosts, comedians Sampson McCormick and Tammy Peay, who will deliver their respective brands of wit and charm throughout the evening. 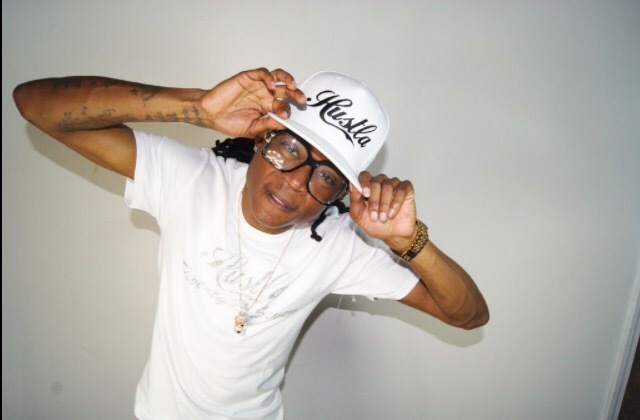 Ellesse has launched the new initiative ‘Make it Music’. In partnership with Metropolis Studios, the brand has created a series of monthly studio sessions that have been filmed and recorded for distribution across press, social media and online. Metropolis Studios is known globally as the world’s No.1 independent recording studio. Around 50% of the UK Top 40 is recorded, mixed, mastered or creatively treated in the iconic complex.Renowned acts including Queen, Michael Jackson, Madonna and the Rolling Stones have worked with Metropolis Studios throughout the years. First to kick off the series will be UK hip-hop artist Paigey Cakey and indie-pop act Jerry Williams. Once a month, Make it Music will release two music artists simultaneously to feature in exclusive interviews, live performances and bespoke content. The variety of music artists will include a range of unsigned, break-through acts as well as more established, recognised talent. “The Make it Music project creates an fantastic partnership between ellesse and some of the best acts and artists coming through right now. We’re incredibly excited to be involved with this talent”. Here at TrueSlamBook we tell it like it is. Yesterday we received an anonymous submission about a recent bamboozling that had taken place in Atlanta. This one hit close to home as it could happen to any of us on the team. 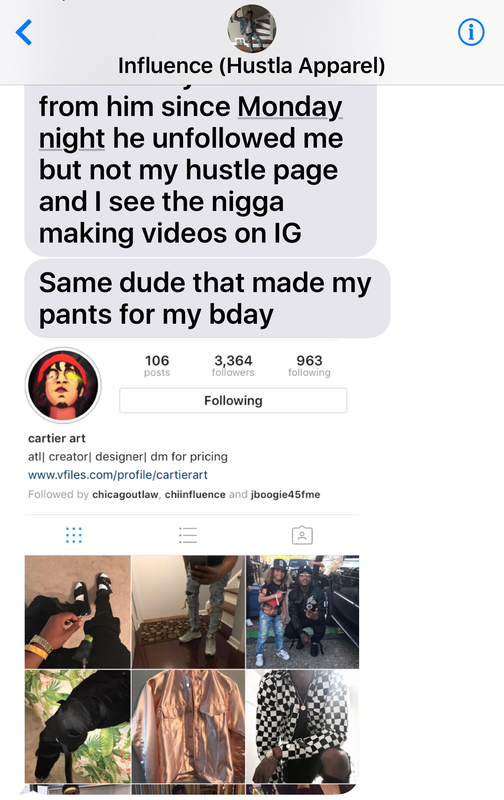 With Social Media Phenoms being an emerging source for unique clothing, we had to bring this one to the forefront and make you aware. Before we get into our take, take a look at what was sent in. Now, lets get into the story as it was relayed. 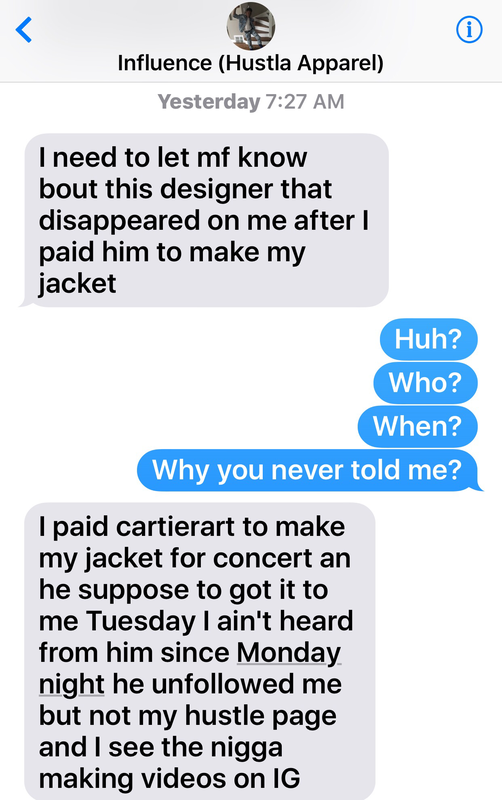 Atlanta Rapper Influence paid Cartier to make him a jacket for a concert. Influence paid half up front and was to pay the other half on delivery. Upon initial delivery, the jacket was an ill fit and alterations needed to be made. Said jacket was taken back by Cartier for the alterations to be executed. This took place on a Friday. Influence advised he was to receive the coat the following Tuesday. Tuesday came and went. Wednesday stopped bye then left. Thursday swung through and left. By Friday, Influence was over it and began to talk to his team about it. Friday morning the leak was sent to us. As you take a moment to sip that tea, we’ll wait! Okay! Now that you’re done lets talk! 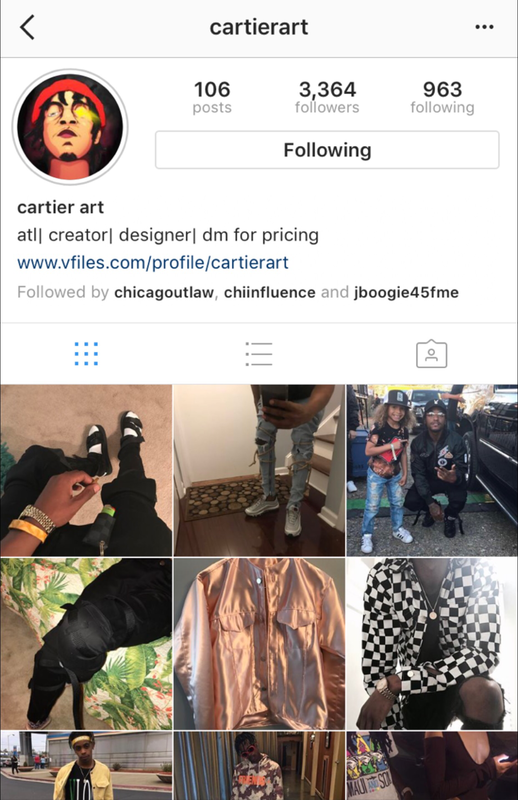 As of now, no statement has been made by Cartier Art. He has blocked Influence on Social Media and is refusing the reply back to text messages or emails. Now, we aren’t one to take sides…….. However, we do have one question for Cartier Art. Is this how you run your business? You take from the very community and base of people who support you? We will follow this case and keep you updated. Who knows what may happen as we hear Influence is not one to be played with……….